After making a stupendous film like Talvar which gave a totally different perspective of what happened with the Talwars in the Arushi case, Meghna Gulzar arrives with a film which is again based on a true story (actually, a novel ‘Calling Sehmat’ based on the 1971 war). The movie is an espionage thriller, set in 1970. Does the lady Gulzar crack it this time too? The answer is YES. 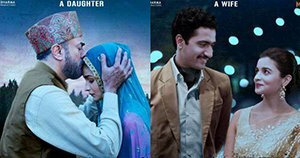 This is the story of a 20-year old Sehmat Khan (Alia Bhatt), daughter of an opulent businessman Hidayat Khan (Rajit kapur) of Kashmir. He comes to know of a stealth news about Pakistan’s plans for war and also about a tumour in his lungs. Hidayat decides to marry his daughter to the son of a rich brigadier, who is also his old friend from Pakistan in the pre-partition era. Hidayat schemes this and before that he gets his daughter under an intelligence agent Khalid (Jaideep Ahlawat). The thriller kicks off once the marriage is done and Sehmat enters the Pakistani army family. Screenplay is the hero of the film. Bhavani Iyer and Meghna Gulzar have made a thriller which is so different when compared to the spy thrillers we have seen so far. The best part of the film is the patriotism comes more powerfully in the subtext than any loud dialogues or any preaching’s. Everything is carried out in a classy way, without compromising on the message or its impact. The tension created is nail biting. There are very effective thrilling moments staying true to the genre. A couple of relationships were performed and executed with great panache. The first is Sehmat’s equation with the trainer, played by the underrated Jaideep Ahlawat. And the second is of Vicky Kaushals – Alia Bhatt’s husband-wife relationship. The nuances are skillfully shown. The movie also tries to make one ponder about the politics and the aftermath of war for the humankind. The film is an adaption of the novel. The writers of the film have also apparently made it look like a peace-loving and diplomatic as opposed to the novel which was apparently calling spade-a-spade. Performances wise, Alia Bhatt take the cake, of course a few over-acting shots to be spared. Her transformation from a tender heat to a strong-willed spy who is prepared to sacrifice her life for the nation, and late the way she sustains is noteworthy. The ensemble cast also does a wonderful job too. Interestingly, Alia’s reel life mother is played by her real-life mother Soni Razdan. The music of the film composed by Shankar Ehsaan Loy bring backs the era. Lyrics by Gulzar, as always magical.The cinematography and the production department especially transports us to the 70. The movie has a very few drawbacks which comprises of the suspension of disbelief and some intended coincidences to make the protagonists job much easier. 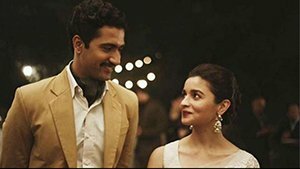 All in all, Raazi is not be missed for its unique story-telling and a silent patriotism.